Thanks for visiting Glamour & Green- the ultimate Blog for any fabulous gluten-free gal looking to find all that super-cool and super-good for you & the environment. Gluten-free is not always associated with “desirable”, but we here at Glamour & Green are here to change that! We don’t see any reason why every day can’t be a glamorous day; one filled with good-for-you goodies, trinkets, and treats! We think that living a gluten-free lifestyle is a gorgeous way of life, filled with lots of luxury and little pleasures… and we’re here to show you! Join us! If you have ever been curious about digital scrapbooking or photo editing, make sure you that visit the DSAM website! Digital scrapbooking IS the ultimate “green” product! No wasting paper and trees like traditional scrapbooking! All the training, papers, embellishments, and supplies are all right there on your computer! …Way cool! 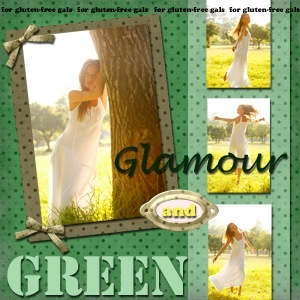 Like this Glamour & Green Digital Scrapbooking Page? We made it using Digital Scrapbooks and More’s Digital Scrapbooking Beginner’s Digital Scrapbooking Training, the Getting Started Series, and the Goals & Resolutions Digital Scrapbooking Scrap Kit! Get training and supplies and start digital scrapbooking today! Buy digital scrapbooking training, digital scrapbooking supplies, and photo editing training and learn how you can create one-of-a-kind photo albums, scrapbooks, memory books, photo stamps, stationary, gifts and more! Let’s begin Glamour & Green on a good foot by offering a special discount in our very first blog entry: Starting March 3rd, 2010, when signing up for the Digital Scrapbooks and More FREE Newsletter, you’ll receive a coupon for 15% OFF your total purchase of digital scrapbooking training, digital scrapbooking supplies, or photo editing tutorials! 🙂 Sweet.